Hi, Allie McMurphy here. Well, it's March and Mackinac Island has been frozen over most of the winter. 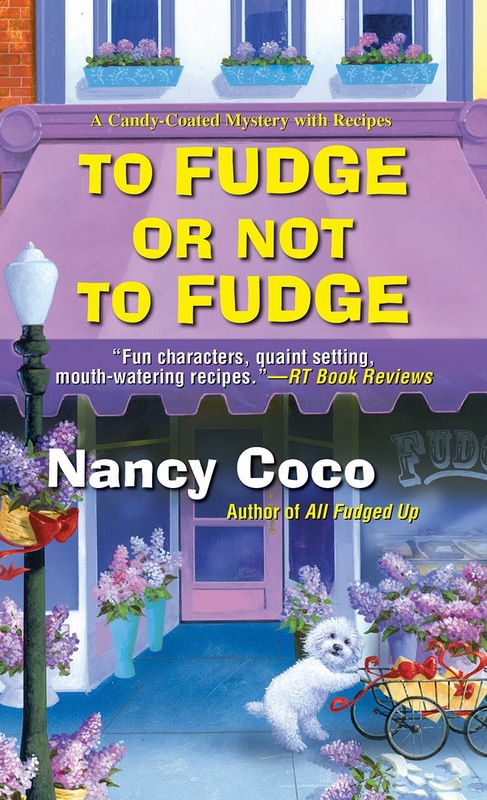 To remind us all that there is more to life than cold and snow, my author is allowing me to show off the new cover for the second book in the Candy Coated Mystery Series, To Fudge or Not To Fudge. The second book takes place over the famous Mackinac Island Lilac Festival and our new cover is full of gorgeous blooms and sweet little Mal pushing a cart of flowers and following clues. Now that you've had a peak at Spring, I'm offering my famous St. Patty's Day fudge to serve up at your March celebration. Don't worry, it's not hard to make. Give it a whirl and let me know what you think. Inside the new book is a recipe for Lilac fudge but you'll have to wait until September for that. My question for you is this: If you could create any kind of fudge in the world, what flavor or flavors would you create? (Hint you just may get a note from my author asking if she could use your idea in our next book). drops of green food coloring to get your perfect St. Patty's Day green. In a double boiler* - melt chocolate, sweetened condensed milk and butter until smooth and thick. Remove from heat. Add vanilla, mint extract and food color stir until combined. Pour the fudge into the prepared pan and spread even. Cool. Refrigerate overnight. Remove from pan. Cut into pieces. Store in a covered container. You can add your own optional ingredients such as pistachios and green maraschino cherries. Hi Willow - Molasses fudge sounds yummy! Have you ever made brown sugar fudge?